Mairead Maguire is a Northern Irish peace activist. She is a Nobel Peace Prize laureate (1976). She is a co-founder of The Peace People: <www.peacepeople.com>. People around the world are deeply concerned about the ongoing crisis in Syria. While we are being presented with some perspective of what is occurring on the ground to the people of Syria, the door seems closed to others. We search for voices we can trust, voices which point to a peaceful, lasting solution to the conflict. We search for truth because it is truth which will set the Syrian people free. Truth is difficult to find, so through the haze of conflicting narratives we must inevitably hear the voices and wisdom of men and women of peace in Syria. Many may believe that there is a fight going on in Syria for ‘democracy’ and ‘freedom’. We can be seduced into thinking there is a magic wand or instant formula to mix that will create a democratic country, but there are none. If it is a democracy a people want they must strive for it in their own way. It is said the greek idea of democracy was that people would be equally valued. This is something every society has to strive for at every point in its history; it itself is a ‘revolutionary’ concept and a nonviolent revolutionary action. Strive to value everyone equally. It is an idea, a motivation for a better world that doesn’t require blood; it requires the hard work of people and the nurturing of a community spirit; a constant growing of peace and it starts within each human heart. Who are the voices of peace in regard to the crisis in Syria? Many of them we cannot hear from where we are standing. They are the mothers and fathers and children who want to leave their homes to walk to market or to school without fear. They are the people, who have been working hard for Syria, for the idea of Syria as a secular and modern country. There are some Syrian voices that have been heard consistently since the beginning of the crisis. Many of them are anonymous and they speak to us about injustices and atrocities. Numbers are given and fingers are pointed. The blame may be apportioned correctly or it may not. Everything is happening too quickly; commentators and politicians are making decisions with haste and looking only in one corner for support for their certainty. But in the heat of the madness of violent ethnic/political conflict we must listen and ask questions and hear and speak with some uncertainty because it is certainty that can take a people and a country in a rush to war. The face of the Mufti of Syria is hardly known in the western world, but if we have learned anything from past conflict, it is the importance of all inclusive dialogue. He and many other Syrians who have peace in their hearts should be invited to sit with a council of elders from other countries, to tell of their stories and proposals for ways forward for the Syrian people. The United Nations was not set up to provide an arena for the voices and games of the powerful; rather it should be a forum for such Syrian voices to be heard. We need to put ourselves in the shoes of the Syrian people and find peaceful ways forward in order to stop this mad rush towards a war the mothers and fathers and children of Syria do not want and do not deserve. We all know there are imams, priests and nuns, fathers, mother, young people all over Syria crying out for peace and when the women in hijabs shout to the world after a bombing or a massacre in Syria ‘haram, haram’ let us hear and listen to them. We are sure there are many heroes in Syria among them, christian patriarchs, bishops, priests, and religious. A modern hero of peace, one whose name we do know and whose voice we have heard is Mother Agnes Mariam. * In her community her voice has been clear, pure and loud. And it should be so in the West. Like many people in Syria she has been placed in life threatening situations, but for the sake of peace she has chosen to risk her own existence for the safety and security of others. She has spoken out against the lack of truth in our media regarding Syria and about the terror and chaos which a ‘third force’ seems to be spreading across the country. Her words confront and challenge us because they do not mirror the picture of events in Syria we have built up in our minds over many months of reading our newspapers and watching the news on our televisions. Much of the terror has been imported, we learn from her. She can tell us about the thousands of christian refugees, forced to flee their homes by an imported Islamist extreme. But Mother Agnes Mariam’s concerns, irrespective of religion, are for all the victims of the terror and conflict, as ours must be. In all our hearts we know War is not the answer for Syria (nor for Iran). Intervention in Syria would only make things worse. I believe all sides are committing war crimes and the provision of arms will only result in further death. The US/UK/NATO and all foreign governments should stay out of Syria and keep their funding and troops out of Syria. We should support those Syrians who work for peace in Syria and who seek a way of helping the 22 million or so people of Syria to resolve their own conflict without furthering the chaos or violence. * Mother Agnes Mariam of the Cross is a Greek-Catholic (Melkite) nun of Lebanese/Palestinian descent and has lived and worked in Syria for 18 years. 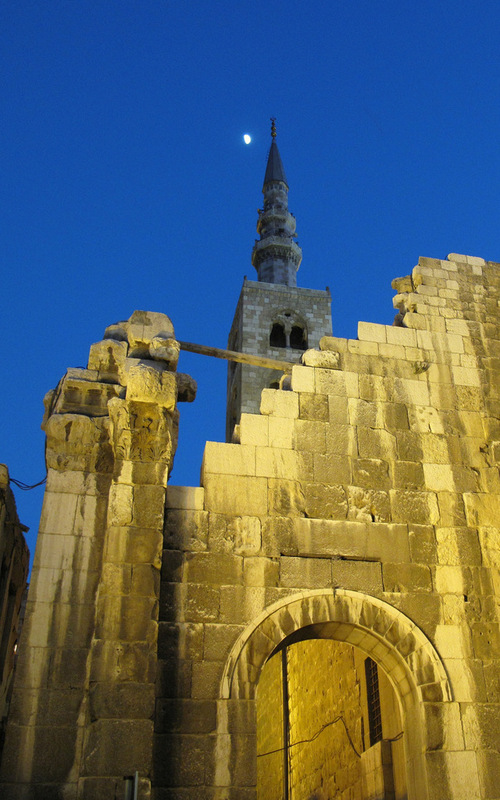 She restored the ancient ruined monastery of St. James the Mutilated at Qara, in Homs province where she founded an order which serves the local and wider community. In 2010 the monastery welcomed 25,000 visitors both Syrian and international: <www.maryakub.org/index_en.html>.